Patricia trained at the College of Sound Healing in Devon, UK as a Gong Practitioner. 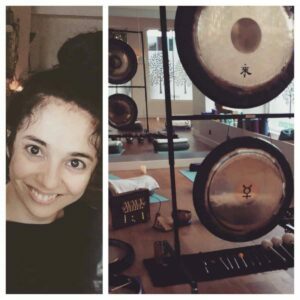 She facilitates group Gong Bath sessions and one-to-one Gong Therapy treatments in the London and Brighton areas, and is passionate about bringing to new audiences the sound of the Gong and related sound tools. She currently works with a 38-inch Paiste Symphonic Gong, a 36-inch Meinl Wu Xing, a 32-inch Paiste Mercury Gong, a 22-inch Tone Of Life Dance Gong, multiple Singing Bowls, the Voice, a Shruti Box, a Frame Drum, and various Bells, Rattles, Shakers, and Chimes. Patricia is a member of the CMA (Complimentary Medical Association) and the College of Sound Healing. Alongside her Gong practice, Patricia is interested in the Human Energy System, altered states of consciousness, nourishing intuition and heart space, connecting with the senses, and the theory of Five Elements. She is an explorer of a number of disciplines, healing techniques and tools that enhance her perception of self and the world, including Reiki, the Munay Ki Rites, the Healing Tao, Shamanic Journeying, Lucid Dreaming, Creative Visualisation, Meditation, Art and Philosophy. SonicSoul represents Patricia’s work as a Gong Practitioner. It expresses Patricia’s passion and commitment to the Gong space.